PortMiami director: "A new big ship era is here and PortMiami and its partners are ready." Florida East Coast Railway can support neopanamax vessels. FECR re-established on-dock intermodal rail service at PortMiami. PortMiami celebrated the arrival of the MOL Majesty, the first neopanamax vessel call on the port after transiting the expanded Panama Canal, on Saturday July 9. The MOL Majesty is part of the G6 Alliance Transpacific PA2 service, originating in Asia. FECR re-established on-dock intermodal rail service at PortMiami, allowing import and export cargo to be loaded directly onto, or off of, awaiting trains, linking the port to 70 percent of the U.S population in four days or less. FECR can also facilitate the transloading of international freight into fewer domestic containers for inland moves, to markets such as Memphis, Chicago, Cincinnati, and Dallas. FECR is a 351-mile freight rail system located along the east coast of Florida. 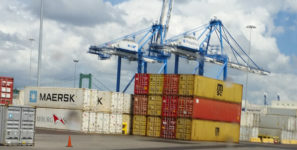 It is the exclusive rail provider for PortMiami, Port Everglades, and Port of Palm Beach and connects to the national railway system in Jacksonville.